June 11, 2018  With teen pregnancy rates in some communities stubbornly high, some schools are trying something different: hire a midwife. 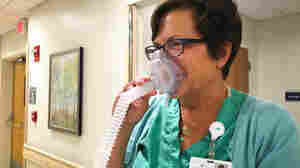 November 7, 2016  Move over, epidurals, here comes nitrous oxide. After enjoying popularity in the U.S. for managing labor pain until the mid-20th century, it was dropped in favor of anesthesia. Now it's back. Should More Women Give Birth Outside The Hospital? July 13, 2015  The British medical system says healthy women with normal pregnancies should give birth at home or in a midwife-led facility. But 99 percent of babies in the U.S. are born in hospitals. July 25, 2013  Pregnancy is unusually complicated in humanitarian crises. Midwives also often have to help women who have experienced sexual violence and have reproductive health issues. Listen to midwife Emily Slocum describe delivering babies in the dark, with no running water. 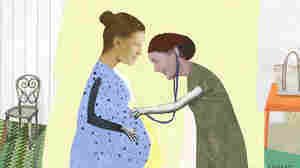 February 14, 2012  Midwives specifically trained in delivery outside hospitals can practice legally in 27 states. In the remaining states, mothers-to-be planning for a home birth will probably be attended by a certified nurse-midwife. September 29, 2010  In Afghanistan, midwifery has become a more widely accepted path for women to take. They serve an important role in a country where pregnant mothers and newborns face huge risks.